THE British Government has rejected calls for an independent probe into the deaths of 11 civilians shot by British troops in Ballymurphy in August 1971. In a letter sent to the families who were bereaved in the west Belfast shootings, the Northern Ireland Secretary of State Theresa Villiers refused the calls on the grounds that it would not be in the public interest. “We, the Ballymurphy families, are shocked and outraged at the British Government’s response, particularly in light of the support which has been rightly provided in the Hillsborough case which includes supporting the legal costs of inquests. The relatives gathered together this morning to receive a letter confirming the decision. In the letter the Secretary of State said “the balance of public interest does not favour establishing an independent review”. In a statement the Secretary of State added:“I would like to reiterate my deepest sympathy and condolences for the families who were bereaved in August 1971. I am aware that this decision is not the outcome the families had hoped for. Having met them – and other families affected by other incidents throughout the Troubles – I know that the passage of time does not ease the pain and hurt felt about the loss of loved ones. In recent years the families have been campaigning for an inquiry similar to the model used to examine the Hillsborough football disaster of 1989 which would review all documents relating to the deaths of their loved ones. In a previous interview as part of The Legacy series professor Phil Scraton, a key architect of the Hillsborough Model, said he believed it could be used to examine controversial killings from the Troubles. An independent panel was appointed to look at the 96 deaths which occurred as a result of a stadium crush during the 1989 FA Cup semi-final at Hillsborough stadium in Sheffield. In contrast, the Bloody Sunday Inquiry cost £191 million and following the publication of Lord Saville’s report the Prime Minister, David Cameron, publicly stated that there would be no more “open-ended and costly inquiries”. But the panel model is seen as faster and more cost effective than other public inquiries and, after it was successfully used in the Hillsborough tragedy, the Ballymurphy families campaigned for a similar panel to be funded by the British and Irish governments. Earlier this year the Irish Government backed the families’ campaign and in March the Taoiseach Enda Kenny raised the issue with Prime Minister Mr Cameron during a meeting at Downing Street. However the Secretary of State’s letter marks the British Government’s first public confirmation that it would not help fund the panel. Over three days in August 1971 eleven people were killed by British troops in the Ballymurphy and Springhill area in West Belfast. Ten of the victims were shot dead, while another was wounded and died of a heart attack. Eleven families lost loved ones and a total of 57 children were bereaved. Mother of eight Joan Connolly was among the civilians shot dead by the Parachute Regiment. Eyewitness accounts compiled by the families detail how she was shot in the face when attempting to aid an already injured man. Further accounts detail how local parish priest, Father Hugh Mullan, approached an injured man waving a white baby grow and was fatally shot in the back when returning to safety. The events unfolded hours after the government introduced a policy of internment – the controversial detention of paramilitary suspects without charge or trial. At the time army officials claimed troops opened fire in response to shots from republican paramilitaries – though this was rejected by the bereaved. Families of the victims say the case raises serious questions over the human rights record of the army in Northern Ireland. 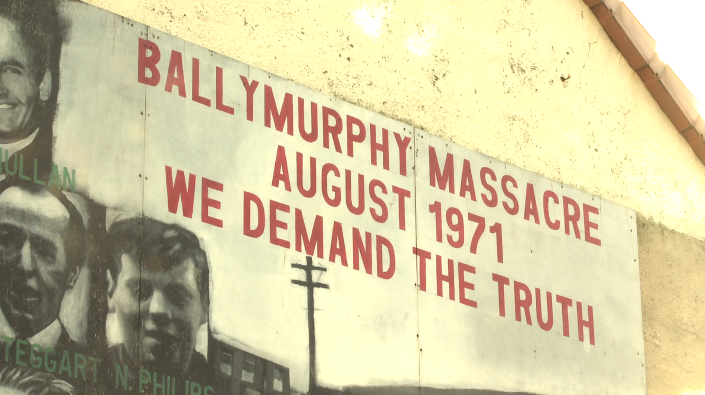 Graphic accounts of the events in Ballymurphy have been recorded . Speaking to The Detail before the Secretary of State’s decision was announced, John Teggart recalled how his father was killed. “One of the eyewitness accounts, that saw my father get shot, said his body bounced with every bullet," he said. “That’s 14 bullets passing through his body from a distance of 50 yards across the road. “I was 11 years of age at the time and we have been campaigning ever since." A number of investigations into the event have proved unsatisfactory for the bereaved families and they have taken their campaign for an independent investigation to Europe. Legal representatives of the Ballymurphy families have openly questioned the fitness of the Historical Enquiries Team (HET), after the UK’s top policing watchdog, Her Majesty’s Inspectorate of Constabulary, found it had serious shortcomings. It said the way the HET reviews deaths caused by soldiers was not sufficiently independent. The shootings in Ballymurphy took place six months before Bloody Sunday in Derry where thirteen people were shot dead when British paratroopers opened fire on crowds at a civil rights demonstration. In November 2011 the Ballymurphy families welcomed the Attorney General’s decision to re-open inquests into the deaths but raised concerns about the limitations of an inquest to investigate “the context, circumstances and aftermath”. In June 2012, the former Northern Ireland secretary of State, Owen Paterson, turned down the campaigners’ request for a full public inquiry inquiry saying it was “not in the public interest”. Today Ms Villiers repeated this position and said she did not believe a Hillsborough-style review would “provide answers which are not already in the public domain or covered by existing legal processes”. In recent years families have been lobbying both the British and Irish governments for the appointment of an independent panel to instead examine all documents relating to the deaths of their loved ones. Its focus would include the investigation of the role of the British Government, British Army, criminal justice agencies such as the RUC, the Coroner’s Office and the significance of the media. In a previous article as part of The Legacy series, The Detail interviewed Queen’s University professor Phil Scraton who was a prominent member of the panel tasked with looking at the circumstances and aftermath of the Hillsborough disaster. Professor Scraton believes killings from the Troubles could be investigated using the same model of inquiry and he is one of the proposed members of the seven member Ballymurphy panel put forward by campaigners. Other proposed members include civil rights lawyer Gareth Pierce and former police ombudsman Nuala O’Loan as chair.